In a future where a failed global-warming experiment kills off most life on the planet, a class system evolves aboard the Snowpiercer, a train that travels around the globe via a perpetual-motion engine. Over time a class system evolves on the train, with the elites inhabiting the front of the train and poor inhabiting the back of the train. Tired of their poor living conditions, the riders in the back revolt, attempting to seize control of the engine. First off, I love the international cast. This is the type of international co-production that I like to see more of. Considering the somber heavy tone of the story, it’s surprising that this movie was even made. Every actor fits their part and they all happen to be character actors in an ensemble piece. Chris Evans makes an engaging lead, never letting his stardom get in the way of his character. Watching him play such a righteous character never once reminded me of Captain America, and that’s probably the best thing I can say. Tilda Swinton is wonderfully ridiculous. When she first appeared, it threw me off because it was so over-the-top. Her character seemed to belong in another film. I wondered if it was possible for someone like that to exist in that environment but as the story unfolded, Swinton’s commitment to her cartoonish portrayal changed my opinion. Song Kang-Ho is always an entertaining presence. He is held back by a language barrier but that is not enough to contain his natural funniness. Jamie Bell and Octavia Spencer both make a dramatic impact with their supporting roles. Alison Pill also has a memorable cameo that teeters between creepy and satirically hilarious. Bong Joon-Ho tells a good proper social science fiction story. The metaphor of the train representing the hierarchy of social class was handled with subtlety. This could vary for other viewers, but the film’s ideas and themes never felt heavy for me. As the lower class move up each train car in a series of action set pieces, I found myself slowly detaching from what was going on and comfortably sinking into the film’s ideas (a problem I had with Edgar Wright’s The World’s End earlier this year). The story’s themes brought me back to the time when I read Aldous Huxley’s Brave New World and George Orwell’s Animal Farm in high school. I thought about human nature, social class and the rich versus the poor, but never for too long because the characters were about to discover what’s in the next train car. The middle portion of the film does sag a bit, but Bong Joon-Ho delivers some nice twists and turns along the way. I read the news about the Weinstein Company is trying to cut a shorter version of Snowpiercer for its upcoming American release. 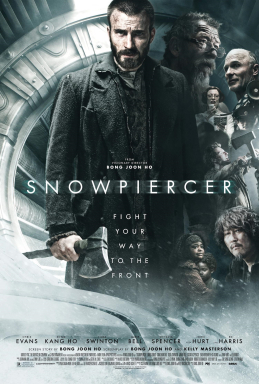 Even thinking in Harvey Weinstein’s terms (and believe me, witnessing the amount of Asian cinema has neutered by Weinstein for the last decade, I consider myself an expert), I don’t see what he thinks Americans won’t understand about the social politics and story in Snowpiercer. The only commercial concern that I can think of is the Korean language portions of the film because American audiences apparently dislike reading subtitles. Korean only takes up a small portion of the film. And actually, an universal translating device is aptly written into film for audiences that prefer to listen. That or Weinstein just wants to put down his authorial stamp for unearthing Asian cinema to the West. So don’t be patronized, if it’s available, please go see the original director’s version. It’s solid science fiction made with proper intentions by a cast and crew that are passionate about the material.